July 12 1909 -- Battling Nelson is in the final day of his training for July 13's fight against Ad Wolgast. He will lose that fight by TKO in a 40-round clash, and then become inactive for six months before rejoining the pugilistic fray. Donald Thompson Carlisle was born on August 20, 1894, in Council Bluffs, Iowa, according to his World War I and II draft cards. In the 1900 U.S. Federal Census, Carlisle and his mother Clara, lived with her parents, Moses and Clara Thompson, in Elgin, Illinois at 416 Chicago Street. The status of Carlisle’s in not known. Carlisle’s grandfather was a civil engineer. Their address was the same in the 1910 census which also recorded a servant in the household. Carlisle’s college education began at the University of Illinois at Urbana-Champaign where he was a cartoonist on the yearbook, The Illio 1915. 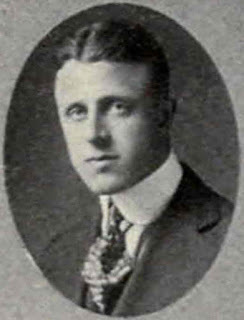 Carlisle graduated from the University of California at Berkeley in 1916. In the 1917 yearbook, Blue and Gold, Carlisle was on staff of the publications The Pelican and Brass Tacks, and a member of the Press Club and Alpha Delta Phi. One of Carlisle’s classmates on The Pelican was Frederick Schiller Faust. Carlisle recalled a story in Max Brand, Western Giant: The Life and Times of Frederick Schiller Faust. The Pelican in our time too frequently came up to the deadline without much material for the next issue, and all hands were forced to stand by and be funny under pressure. I remember one spring day when everyone else on the staff being A.W.O.L., Heinie and I found ourselves the only two available to put the paper to bed — and with literally nothing on hand worth publishing. He appeared at my room about four in the afternoon with a bottle of gin and we went at it. By dinner time we had laid out the entire issue and he had written nearly all of the copy besides giving me the gags for most of the cartoons. On June 5, 1917, Carlisle signed his World War I draft card. His address was 427 Wrightwood Avenue in Chicago. Carlisle was employed at Thielecke Advertising Company where he did agricultural advertising. He was described as tall and slender with blue eyes and light brown hair. Carlisle claimed an exemption due to an unnamed physical disability. At some point, Carlisle moved to Brookline, Massachusetts. Boston city directories, from 1920 to 1925, listed Brookline resident Carlisle as an advertising representative at 10 State Street, room 905. The Massachusetts Marriage Index, at Ancestry.com, said Carlisle married in 1923 in Brookline. The 1925 Brookline city directory listed Carlisle and Katherine at 56 Marshal. The 1927 Boston directory said Carlisle lived in Foxboro and had the same business address. In the 1928 Boston directory, Carlisle’s listing read, “removed to New York City”. 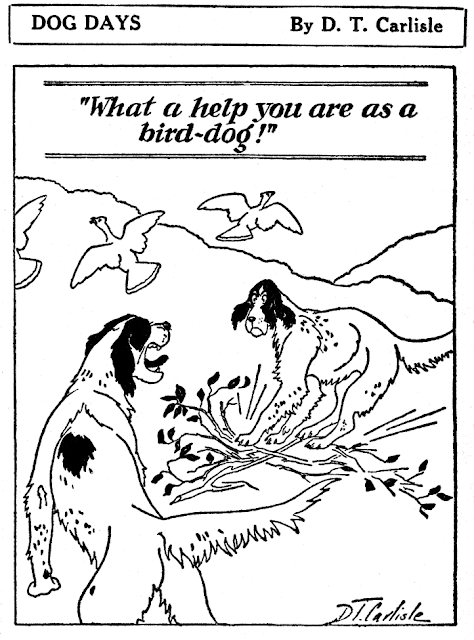 American Newspaper Comics (2012) said Carlisle produces Dog Days for the McClure Syndicate. 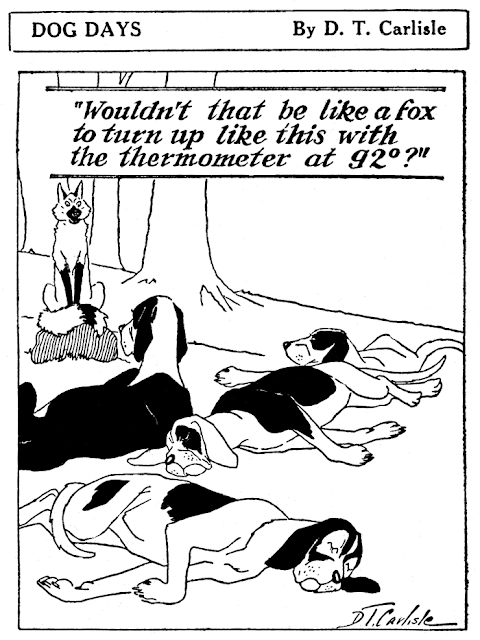 Dog Days debuted January 7, 1929, was retitled Life of Riley on November 25, and ended May 23, 1931. Carlisle’s The Belvidere Hounds was published in 1935. Carlisle and his wife traveled to Europe. On June 25, 1930, they sailed on the steamship Cleveland from Hamburg, Germany. They arrived in Boston on July 6. Their address was 10 State Street, Boston. 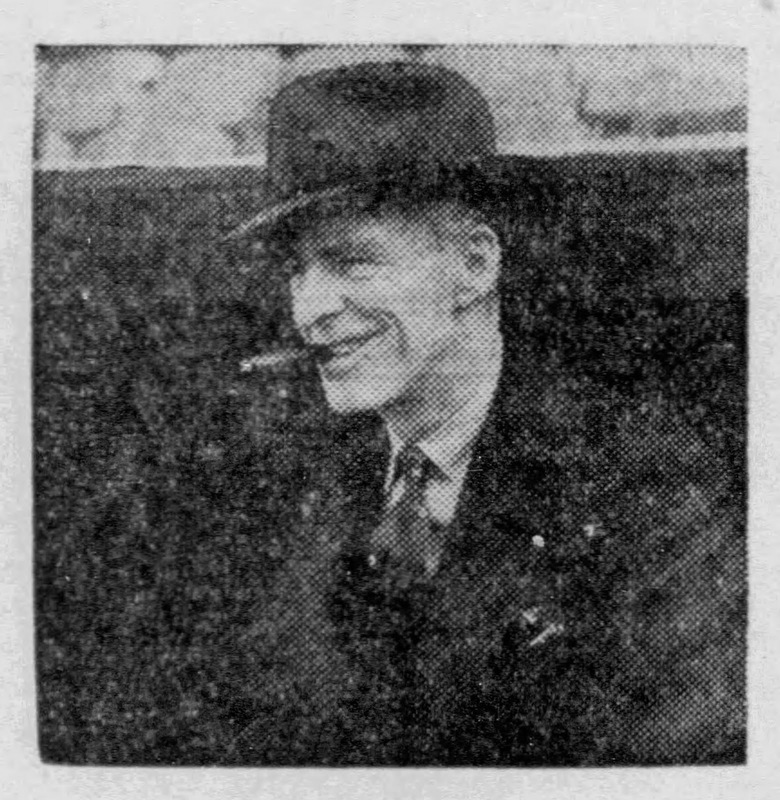 The Philadelphia Inquirer, October 8, 1934, noted Carlisle’s latest employment. Donald T. Carlisle, well-known in the commercial advertising, has joined staff of Doremus & Co., Inc. at their New England headquarters office, 20 Kilby street, Boston. Mr. Carlisle was born in Council Bluffs, Iowa. He was a cartoonist on the Chicago Tribune when but 14 years old. He had his first advertising experience with the David Williams Publishing Company at New York in 191?. At Ancestry,com, the Massachusetts, Mason Membership Card database said Carlisle was a member at the Saint Andrews lodge. The 1940 census recorded Carlisle, his wife and mother in Foxboro at 57 Granite Street. He was an advertising executive at Alley & Richards in Boston. The same address and employer were written on Carlisle’s World War II draft card which was signed on April 26, 1942. Carlisle’s description was six feet four inches, 185 pounds with blue eyes and gray hair. Carlisle’s drawings from his book, The Ordeal of Oliver Airedale, were featured in Life, October 6, 1941. Carlisle passed away April 6, 1956, in Poughkeepsie, New York. An obituary appeared in the Brewster Standard (New York), April 12, 1956. Private funeral services for Donald T. Carlisle, 61, vice president of the New York Zoological society, whose death occurred in St. Francis Hospital, Poughkeepsie, on April 5, 1956 were held at Patterson on Sunday. Mr. Carlisle was a resident of Patterson and New York City. Son of Mrs. Clara Thompson Carlisle and the late John Carlisle, he spent his early years in Elgin, Ill., and later attended the University of Illinois. He received his machelor [sic] of arts degree from the University of California in 1916. He was a member of Alpha Delta Phi, the Lodge of St. Andrews in Boston, the Tavern club of Boston, the Coffee House and the Century association of New York city. His wife, Mrs. Katherine Vallandingham Carlisle, is assistant to the alumnae secretary at Vassar College. For many years Mr. Carlisle was in the advertising business with the Batten Co. in New York, later Batten, Barton, Durstine and Osborne. He served as a lieutenant colonel in American military government in World War II. In recent years he was a reviewer and illustrator of a number of books on natural history for the New York Times Sunday Book Review, but was best known as a cartoonist. His series, “The Belvedere Hounds,” ran for several years in the “Sportsman” and later was published in a book. Whereas, his work for the success of the Society’s activities will be of permanent value to it in the future. Now, therefore, be it resolved that the death of Donald Carlisle is hereby recorded with a great sense of loss both from the point of view of his many admiring friends and associates within the organization of the Society and also because, through his passing, the Society has lost the services of a man of rare gifts and character. 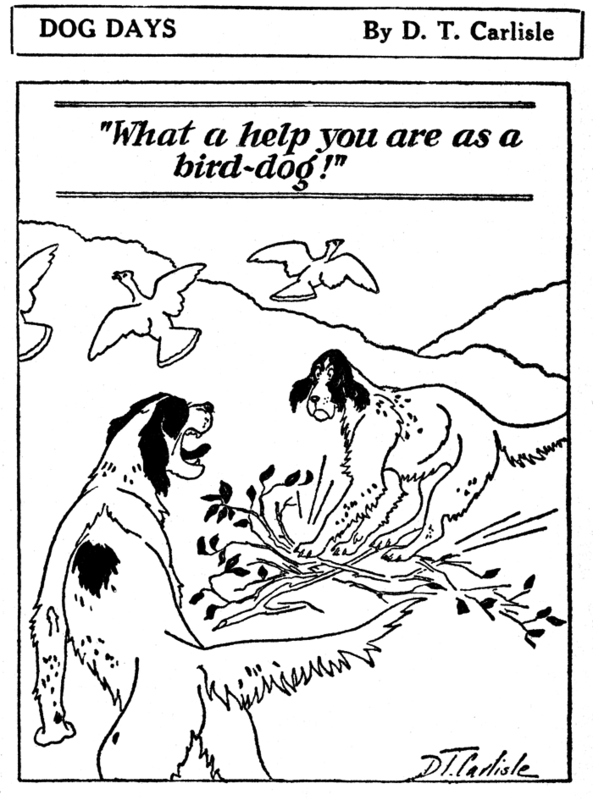 Dogs are always a good bet if you want to earn yourself a spot on the newspaper comics page. Most everyone loves dogs, even newspaper features editors. That made it a smart move, seemingly, for the McClure Syndicate to accept a new panel cartoon from D.T. Carlisle, titled Dog Days. The panel featured a miscellany of dogs, but there was a definite preference for hunting hounds. Although the panel was first advertised by McClure in 1928, the start date appears to be January 7 1929. There was little fanfare for the new panel, but it was picked up by some major papers, like the Arizona Republic and LA Times. 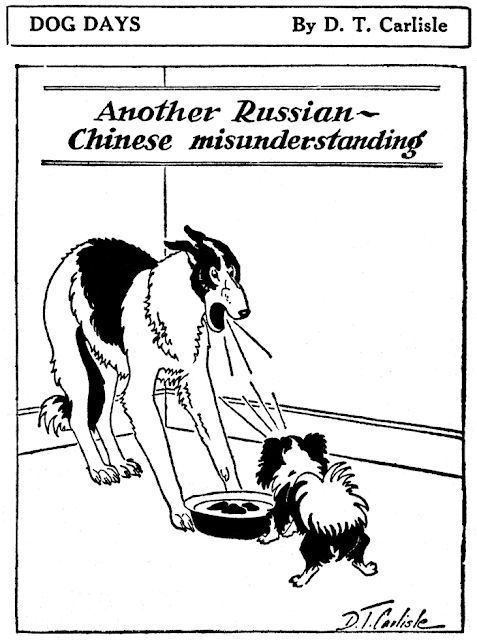 Small wonder, because Mr. Carlisle had a real gift for drawing dogs, and his humor, while hit-and-miss, landed often enough to keep readers looking forward to the next daily dose. You've heard me opine often enough in this space that features seldom really take hold unless they have continuing characters. Well, Carlisle seems to have been in agreement with that philosophy, because late in 1929 he phased out his cast of miscellaneous dogs, and began concentrating on an Irish terrier named Riley. On November 25 1929 the title of the panel was officially changed to Life of Riley (though many papers stuck with the original title). While that might have been a smart move, what came next was most definitely not. After a year of gag-a-day Riley caroons, Carlisle for some reason decided to switch to a continuity format. While the continuity was initially somewhat humorous, it morphed into a half-baked adventure in which Riley and some dog pals ended up on a tropical isle looking for a treasure chest, while sparring with the island's inhabitants, which included goats, parrots and an orangutan, and avoiding some aviators who were looking for the same treasure. Carlisle had no gift for writing continuity, and even if he did, trying to relate an adventure at the rate of a single panel per day is a dicey proposition at best. It was a complete flop, and his subscribers quickly bailed on him. By the time the panel was cancelled, apparently on October 10 1931, I'd be willing to bet he only had a few clients left. The final panel has Riley being abducted by the orangutan, and I guess living happily ever after. I have no information on Carlisle except that he had another dog cartoon feature that ran in the magazine The Huntsman, and that one (featuring hunting dogs, of course) was a much-loved feature of that periodical. The cartoons from there were collected in at least two books, both of which are scarce and apparently much sought-after today. Carlisle also produced at least one further book of original dog cartoons, The Ordeal of Oliver Airedale. In the 1900 U.S. Federal Census, Gibbs and his widow mother lived in Cincinnati at 32 Ninth Street. He was a printer and his mother a dressmaker. Two shoemakers boarded with them. Also in the same building were two artists, a German husband and wife, whom Gibbs nay have known. The 1900 through 1904 Cincinnati city directories listed Gibbs as a draftsman with The U.S. Printing Company. Gibbs was an artist with the same company in 1905 but lived at a different address, 131 West 9th. The Sun said Gibbs moved to Baltimore in 1906 and worked for a few years as a lithographer. The 1907 Baltimore city directory said artist Gibbs resided at 1109 Gorsuch Avenue. The District of Columbia, Compiled Marriage Index recorded Gibbs’s marriage to Alma M. Luken on February 26, 1909. Gibbs had not yet been found in the 1910 census. The 1910 Baltimore city directory listed the artist at 2504 Greenmount. A short time later, Gibbs’s address was 702 Linwood Avenue in Baltimore directories into the mid-1920s. The Baltimore Sun cartoonist signed his World War I draft card on September 20, 1918. He was described as medium height and weight with gray eyes and black hair. The 1920 census listed cartoonist Gibbs, his wife and three sons, Carleton, Irvin and Robert. They are Baltimore residents at 702 Linwood Avenue. Gibbs joined The Evening Sun staff as a political cartoonist, and produced a comic strip, Abe and the Duck*. 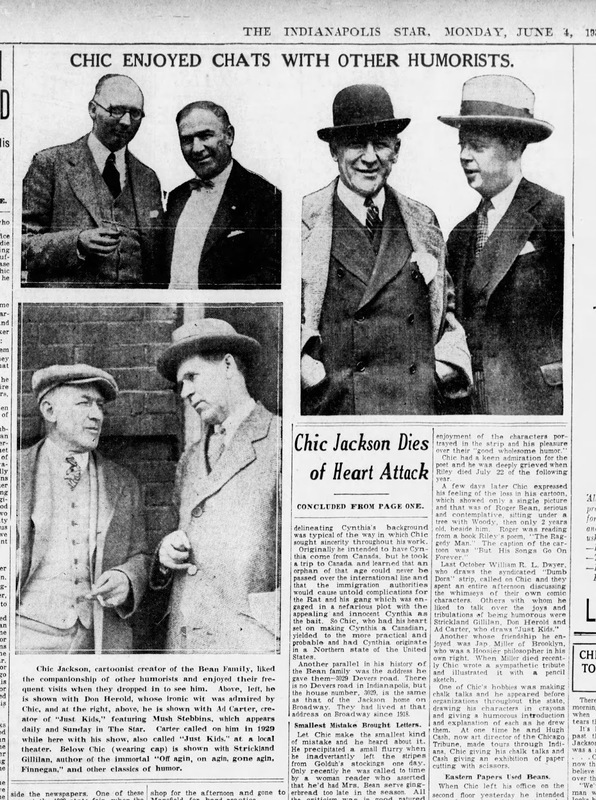 Editor and Publisher, August 2, 1924, said Gibbs’s friends called him Abe. They call him “Abe” after his famous grouch character, a lean old geezer with whiskers who knocks everything, and who is always accompanied by an optimistic Duck as a foil. Along with the pictorial comment in this combination, Gibbs writes a good-natured bottle of vitriolic suggestions about the bones being pulled by everybody in the sports game, and brings to his aid a keen knowledge of the game in all its departments. And he knows the game, too—knows it thoroughly and writes into his knowledge a humor that has made a big field of readers His knowledge of the game and his style are the combination that get men into the syndicate runs. “Abe’s” recreations are as many kinds of work as there are departments of sports. Sometimes he goes home and plays with the three little boys who call him Daddy, and now and then he goes swimming or fishing with the man who writes “Songs of the Craft” for Editor & Publisher. But outside of that he gets most of his fun out of life by jack-knifing his frame over the drawing board, making pictures of Abe and the Duck, and sitting at his typewriter hammering out short, swift, but kindly stabs at everybody and everything in general. American Newspaper Comics (2012) said Gibbs produced Go-Go from 1923 to 1924 for the International Syndicate. The series was copyrighted. Gibbs’s home was at the same location in the 1930 census but the name of the street had changed to Deepdene Road. Gibbs’s mother-in-law was part of the household. According to the 1940 census, Gibbs was a sportswriter. Gibbs, his wife and son Irvin were at the same address. On April 26, 1942, Gibbs signed his World War II draft card. His employer was the A.S. Abell Company, owner of The Sun. Gibbs passed away May 21, 1966, in Roland Park, a suburb of Baltimore. The Sun reported his death the following day. * note from Allan: although Gibbs definitely used these characters regularly in his sports cartoons for the Evening Sun, I have not been able to find any evidence of a comic strip featuring the characters, in a general perusal of the Evening Sun archives. Chic Jackson died yesterday afternoon. Death came suddenly and as he would have wished it -- when his day's work was done. The creator of the Roger Bean Family, a cartoon strip that bubbled through the years with homely and piquant Hoosier philosophy, left his drawing board in The Star building shortly after 3 o'clock. He was stricken with a heart attack as he stopped in the hall and died a few minutes later. Efforts of police and fire department first-aid squads and Dr. Sollis Runnells to save him were of no avail. Funeral services will be held at 2 o'clock tomorrow afternoon in the Hisey & Titus funeral home, 946 North Delaware street, and Dr. William F. Rothenburger, pastor of the Third Christian Church, will deliver the funeral sermon. The body will lie in the funeral home from 10 o'clock morning until the time for the services. Burial will be in the Beech Grove cemetery in Muncie Wednesday morning and arrangements will be made for his friends there to view the body before internment. Chic Jackson had friends throughout the length and breadth of Indiana and those who did not know him personally knew him through his cartoon strip in which he portrayed a typical Hoosier family in its intimate and joyous life. The strip has appeared in The Star twenty-one years and in other Indiana and Eastern newspapers many years. Readers grieved with the Beans in their moments of adversity, although Chic Jackson's nature was not such that he could let any pen-child of his stay long in despondency. In the same way, they chuckled at the barbed and boisterous homespun wisecracks of Golduh, the Bean's hired girl; Jose and all the others who brightened the pages of The Star and other newspapers through his sympathetic pen. 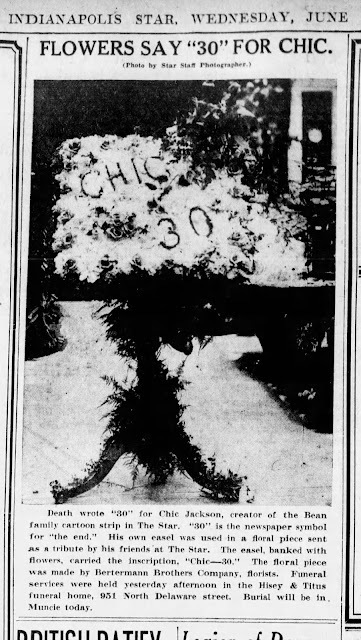 Chic Jackson, who always preferred "Chic" to his christened name of Charles Bacon, was 57 years old and he was born just before midnight on New Year's eve, 1876, in Muncie. He attended Muncie schools and then was employed on the Muncie News and was with it when it was absorbed by the Muncie Star. There he met Margaret Wagner of Springport, who also was employed on the newspaper, and they were married in 1902. In Muncie he was illustrator and front page cartoonist, making his drawings, as was the method then, on chalk plates. He and his bride went to Chicago and stayed there one year, where he studied at the Chicago Art Institute. 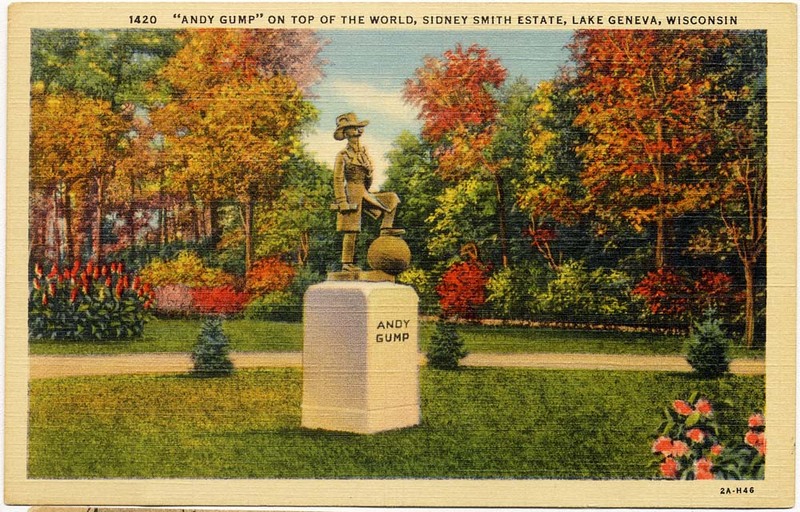 From there they came to Indianapolis in 1907 and he became the artist for The Star, at first doing Sunday feature illustrating, and later developing the Bean family into a comic strip. Mr. Jackson's comic strip family first appeared in The Star April 22, 1913. 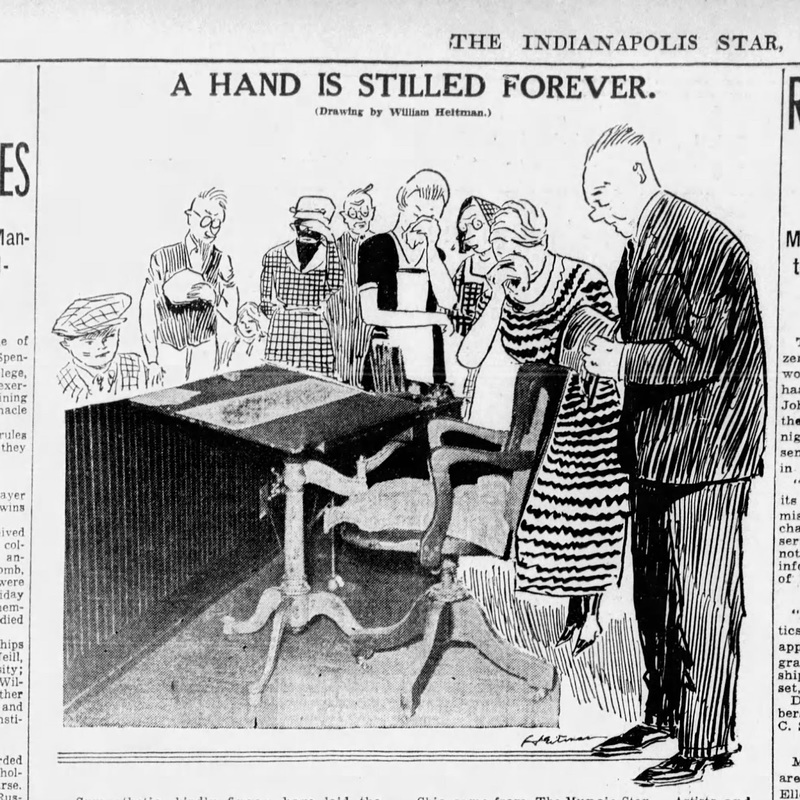 The first drawing, appropriately enough, showed Mr. and Mrs. Roger Bean alighting at the Union Station and preparing to settle in Indianapolis. Mrs. Jackson followed the career of the Bean family with just as much interest as any one of the thousands of readers of The Star and often aided in solving its problems. She survives with two sons, William Charles Jackson, who lives with his wife and son Jed at 4818 College avenue, and Richard Wagner Jackson, a reporter on the South Bend News-Times. There also are two brothers, Dr. Frank Jackson and Warren Jackson, both of Muncie. Mrs. Jackson's brother, the Rev. C.E. Wagner of Joplin, Mo., will come here for the funeral. Chic's chief interest, outside of his family and the Bean family that he created, was people. He liked people, he was drawn to them and they to him. He felt the heart tugs of their little setbacks and their greater sorrows and he chuckled at their idiosyncrasies. His sympathy was aroused easily and he was too tolerantly whimsical to utter an unkind word. His humor was quaint and joyous and never biting. Those who knew him in the early part of his life say that these qualities and his intense interest in the ties of family life might be attributed to the loss of his mother when he was 2 years old. Roger Bean, Mrs. Bean, Golduh, Woody and all the other human and laughable characters that were animated with his contagious humor during the years were not merely pen and paper figures to him. To him they were real people, some of them even were his own family, and as for Roger Bean, that bluff, good-natured fellow who started it all -- Roger Bean was almost Chic Jackson himself. Those who knew Chic recognized that Roger was merely the instrument through which Chic expressed his own philosophy of the every day. "The Bean family, to Chic, was every bit as real to him as we were," Mrs. Jackson said. It started with Roger and Mrs. Bean and then came Golduh, the vigorous and quick-spoken redhead, to work as their "hired girl." Later came "Woody" Bean, whose complete name was Woodrow Smith Bean, and one can easily see that he came during the administration of the war President. The Smith in "Woody's" name came from Mrs. Bean's family, whom Chic had decided would be of that multitudinous assemblage. Soon came various other characters to join in the delightful procession. There was Mrs. Probe and Mr. Probe and the drawling Jose: Buck, who was Golduh's brakeman sweetheart, the ice man, the coal man, the messenger boy, and that aggravating rooster of Mrs. Probe's called Joey. There was Uncle Castor, lovable Uncle Wash, Mr. Burleson and a host of others. Then there was the case of Cynthia, who became a member of the Bean family through adoption. The care used in delineating Cynthia's background was typical of the way in which Chic sought sincerity through his work. Originally he intended to have Cynthia come from Canada, but he took a trip to Canada and learned that an orphan of that age could never be passed over the international line and that the immigration authorities would cause untold complications for the Rat and his gang which was engaged in a nefarious plot with the appealing and innocent Cynthia as the bait. So Chic, who had his heart set on making Cynthia a Canadian, yielded to the more practical and probable and had Cynthia originate in a Northern state of the United States. Another parallel in his history of the Bean family was the address he gave them -- 3029 Devers road. There is no Devers road in Indianapolis, but the house number, 3029, is the same as that of the Jackson home on Broadway. They had lived at that address on Broadway since 1918. Let Chic make the smallest kind of mistake and he heard about it. He precipitated a small flurry when he inadvertently left the stripes from Golduh's stockings one day. Only recently he was called to time by a woman reader who asserted that he'd had Mrs. Bean serve gingerbread too late in the season. All the criticism was in good-natured vein and Chic always answered in kind. Thousands of letters had come to him from all over the country to point out any small discrepancy and other thousands wrote just because they wanted him to know the enjoyment they got from his strip. For a long period when Golduh was addicted to brickbat throwing on the slightest provocation he would receive in the mail now and then a brick, decorated with a fancy ribbon, or perhaps one from some historic building being wrecked. "Let Golduh throw this one," the sender usually suggested. There is still a pile of these bricks in Chic's room in The Star. Chic's gentle humor touched many a responsive chord. Among his cherished recollections was one of a call that James Whitcomb Riley made in 1915. The poet was infirm and unable to leave his car, but he sent his chauffeur to the second floor of The Star building with a request that Chic come down to the parked automobile. There Riley told him of his enjoyment of the characters portrayed in the strip and his pleasure over their "good wholesome humor." Chic had a keen admiration of the poet and he was deeply grieved when Riley died July 22 of the following year. A few days later Chic expressed his feeling of the loss in his cartoon., which showed only a single picture and that was of Roger Bean, serious and contemplative, sitting under a tree with Woody, then only 2 years old, beside him. Roger was reading from a book Riley's poem, "The Raggedy Man." The caption of the cartoon was "But His Songs Go On Forever." Last October William R.L. Dwyer, who draws the syndicated "Dumb Dora" strip, called on Chic and they spent an entire afternoon discussing the whimseys of their own comic characters. Others with whom he liked to talk over the joys and tribulations of being humorous were Strickland Gillilan, Don Herold and Ad Carter, who draws "Just Kids." Another whose friendship he enjoyed was Jap Miller of Brooklyn, who was a Hoosier philosopher in his own right. When Miller died recently Chic wrote a sympathetic tribute and illustrated it with a pencil sketch. One of Chic's hobbies was making chalk talks and he appeared before organizations throughout the state, drawing his characters in crayons and giving a humorous introduction and explanation of each as he drew them. At one time he and Hugh Cash, now art director of the Chicago Tribune, made tours through Indiana, Chic giving his chalk talks and Cash giving an exhibition of paper cutting with scissors. When Chic left his office on the second floor yesterday, he intended to send a series of his cartoons by mail to the George Matthew Adams Syndicate in New York, which had charge of distribution of his work among a group of newspapers. These included papers in Schenectady, N.Y.; Camden, N.J.; Dorrance, Mass., and others. The strip had been run in the Schenectady and Dorrance papers almost as many years as it had appeared in The Star. Indiana papers in which the strip has appeared are in Gary, Fort Wayne, Muncie and Terre Haute. He had begun work in his office at 10 o'clock yesterday morning and had been steadily at work until about 3 o'clock in the afternoon. He had walked through the city room, picked up some wrapping paper and hailed members of the staff with his usual cheery greeting. He re-entered his office, talked over the telephone with Mrs. Jackson and gathered together his drawings to be put in the mails. After he left his room he stopped at the telephone switchboard near the top of the stairway and told Mrs. Kathryn Fender, operator on duty, "Well, I guess I'll go home." As he turned to go he was stricken and collapsed. Mrs. Fender called others in the building. 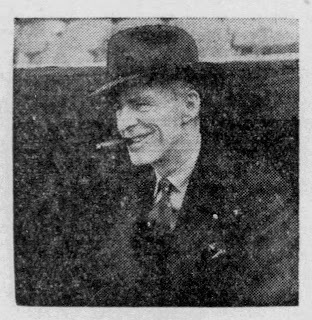 J.P. Edmison, chief editorial writer for The Star, was one of the first to reach his side and held Chic as he died. Chic Jackson died with his last ambition unfulfilled. He wanted to see Woody Bean through college and started on adult life before laying aside his drawing board and wiping the India ink from his pen for the last time. Woody, the 20-year-old adopted son of Roger and Sylvia Bean, like every other character that played a part in the Bean family comic strip, was as real to Chic as though he were flesh and blood. The galaxy of men, women and children that Chic had created in the more than twenty-one years he had been at work in The Star building were as alive to the cartoonist as any novelist's creations ever could be to an author. Chic could tell you what they did and what they thought about when they were not "working" for their public within the confines of the strip. "I've got one ambition in life," Chic said. "That's to get Woody through college and see him settled in life. I want to see him well started on his own career. If I didn't do that I'd feel that I hadn't done right by him." Woody is a freshman in college now, in his first separation from the life of the family circle. Chic brought him up from babyhood through the experience of infancy, first school days and the pains and pleasures of boyhood. Certainly Roger Bean himself couldn't have been happier to see the boy on the threshold of manhood. It seems pretty well established that Woody is the first comic strip child that grows. On Christmas day, 1914, he was found in a market basket on the Bean doorstep. He was six weeks old then, as near as anyone could determine. After due consultation with Mrs. Probe and other neighbors, he was adopted. He was named Woodrow Smith Bean. Chic had some hesitation about introducing the child into the family, for in 1914 the facts of life were mentioned in whispers, and Freud, Jung and Adler had yet to hear their names become household words. Nevertheless, The Star's readers welcomed the baby. Only one person came forward with a protest. An old-line Democrat, incensed because a mere comic strip character had been named after the President of the United States, canceled his subscription. Chic didn't realize that the natural growth of Woody was an innovation. From the time of the first appearance of the Bean family on April 22, 1913, he had lived up to the ideal of presenting only the quiet humor of everyday life. He thought there was a field for such humor among the slapstick comics of the newspapers of the time, so he eschewed gaudy effects and adhered to the actual and natural aspects of family life. Thus Chic was surprised when readers and friends called his attention to the growth of Woody when the boy was about two years old and was beginning to say a few words. Woody was contrasted with other juveniles of the comic sections, the Katzenjammer Kids, Buster Brown, Cicero Mutt and Chester Gump, who remained unchanged for decades. They say around The Star office that Chic felt that his time to die was not far off, and that the feeling had been intensified since he suffered a severe attack of heart disease about a year ago. However, Chic wasn't plaintive about it, nor did he express the feeling in bald words. "Yes, I thought I'd have them framed and put there because they are probably the last things of that sort I'm going to do." On the other wall of his office he had a large painting of the entire Bean family and other characters, drawn almost life size. "That's how they look when they're off-duty," he would say of the painting. Other paintings by Chic, on subjects not connected with the Bean family, also were part of his permanent office fixtures. One cabinet is filled with gifts that followers of the Bean family have sent to its various members. Golduh is especially favored here. Innumerable persons have sent her bricks to replenish her constantly-depleted stack. Among these are two bricks from the original Governor's mansion which stood on the Circle many years ago. Two are from the Indiana University fieldhouse, sent to the obstreperous redhead by President William Lowe Bryan. Other admirers have sent her striped stockings. Statuettes of Golduh and of other characters are among the collection. One of the oldest gifts is the "original package" of My Lady's Slipper, the rough-cut eating tobacco to which Uncle Wash is addicted. Although Chic's days were devoted to the production of the Roger Bean family's appearances, he found time to make sketches and drawings for many individuals and organizations in the city. On special occasions he drew special cartoons for The Star. One of the drawings he made for his own amusement eight years ago developed into an institution. This is a mock diploma for the "bachelor of health" degree which he presented to the Marion County Tuberculosis Sanitarium. "Be it known that this day marks the beginning of a new era of good cheer and health for Student John Doe. This degree is based on the theory that a smile is a tonic whether you are on the receiving or sending end and proves the isolation of the germ of good humor." A class motto inscribed on the lower left hand corner reads, "Love your nurse and doctors -- the more the merrier." Sanitarium officials decided the diploma had more than transient value. They printed copies of it and presented them to patients who had "graduated" from the hospital by conquering the ravages of tuberculosis. About six hundred diplomas already have been given. Dr. William McQueen, superintendent of the sanitarium, presented a copy, inscribed with Mr. Jackson's name, the date of presentation and signatures of Dr. McQueen and Dr. R.S. Henry, to the cartoonist at the weekly luncheon of the Rotary Club last Tuesday. "Some of our former patients have told us that they value their health diplomas more than they would a college diploma," Dr. McQueen said at that time. A new supply of the diplomas was printed recently. On three occasions in recent years the Bean family has appeared outside the newspapers. One of these was at the 1929 state fair, when the Indiana University show included a skit, "The Return of Woody Bean." Chic made a personal appearance with this show. In the spring of 1931 a series of sketches of Bean family life appeared on the radio via WFBM, Indianapolis Power and Light Company radio station. The broadcast also was part of the state fair that fall. In February, 1933, when the jigsaw puzzle craze was at its zenith, Chic prepared a series of drawings in color which were made into puzzles. Back in 1929 when Charlie Davis was master of ceremonies at the Indiana theater, the versatile band leader composed a song, "Golduh." The song was presented as part of the Indiana stage show in April. The conditions of life in Indianapolis have been reflected in the doings of the Bean family. When they first came to the city in 1913, houses were hard to find and several days were devoted to the tribulations of house hunting and getting settled. In similar fashion, the trends and tides of municipal life have rippled the surface of the life of the family down the years. In the fall of 1913 the need for domestic help around the Bean home became apparent. Roger hired a girl who might have come straight from the chorus of a musical comedy, but Sylvia flagged him down before the girl even set foot in the house. Mrs. Bean thereupon engaged the services of one Golduh Stubbins of Bucyrus, O. As the months went on other new characters came in. The inquisitive and bellicose Mrs. Alvina Probe, wife of Henry, was the next one after Golduh.The initial visit of Uncle Castor Bean from Boston came in 1914. Cynthia Bean, now in her fifth year, is one of the later acquisitions. Like Woody, she was adopted by the Beans when she was a baby and has been growing up like any living little girl. "Buck," the dynamic railroader who woos Golduh, also is a younger member of the strip's cast of characters. When Golduh was created, Chic picked the home town of the Stubbins family off a map of Ohio, quite at random. He did not visit Bucyrus until the summer of 1931, but plenty of people from Bucyrus have visited him, most of them with fire in their eyes. "When I chose Bucyrus," Chic used to say, "I never imagined I'd ever see the town or meet anyone from there. But it seems that I've met the entire population." Since Golduh in her younger days was hoydenish, boisterous and belligerent, citizens of Bucyrus took their relation with the Bean family comic strip as a direct affront. It was several years before the anti-Chic Jackson feeling died down. At the height of public unrest in Bucyrus, when comments in letters to the editor of The Star from that town were exceedingly acrimonious, twenty residents of Boswell, Ind., came to the aid of the harassed cartoonist. They offered Lem Stubbins (who at the time drove a one-horse team) the use of a two-ton truck if he would move to Bucyrus. "Was just over to see Lem Stubbins, but he has closed his barber shop for the afternoon and gone to Mansfield for band practice. Chic watched the young man in the Bucyrus telegraph office closely, but not a flicker of rage or any other emotion crossed his features. So Chic figured that the old enmity around Bucyrus had faded away. "Historically, I was born in Muncie so long ago, and left there so long ago that the old town has recovered from my early citizenship; and now when I run back for a brief visit I find no ill effects, but there are still some who talk about it like they speak of an appendicitis operation and insist on showing the scar! "I arrived just before midnight on New Year's eve; everybody was attending a watch party except my mother, who dutifully enough never left me for a minute. "Of course you are curious to know of any early manifestations of this queer characteristic which is proving to be my life's work, which reminds me that only recently an old-timer asked me if ever I expected to settle down and do something useful! I draw (I have always drawn) attention to my general inability to stick to "real" work -- according to my friends -- and when I think of the many jobs I have tried to learn to love and failed, they are doubtless right. Imagine me, if you please, at work in a shoe factory, a glass factory, rolling mill, steel mill, nut and bolt works, grocery store and brickyards! Note that these are the callings of hard-handed, red-blooded sons of industry; I sought nothing soft, but be it said to the credit of the several bosses whom I served, they did nothing to encourage me in embracing any one of these occupations. In some cases they insisted that I tarry not -- thus preserving me for this pleasant task of writing my life. "Facts: I connected with my home town paper as illustrator and front page cartoonist; then twenty-five years ago I attended Chicago Art School one year; then to the Indianapolis Star. Nineteen years ago the Bean family had its premiere, and since then my life and family connections are as an open book. "I was married to Margaret Wagner of Springport, Ind., and we have two boys, who frequently laugh at my stuff. "My favorite flower is old-fashioned buckwheat with sausage." 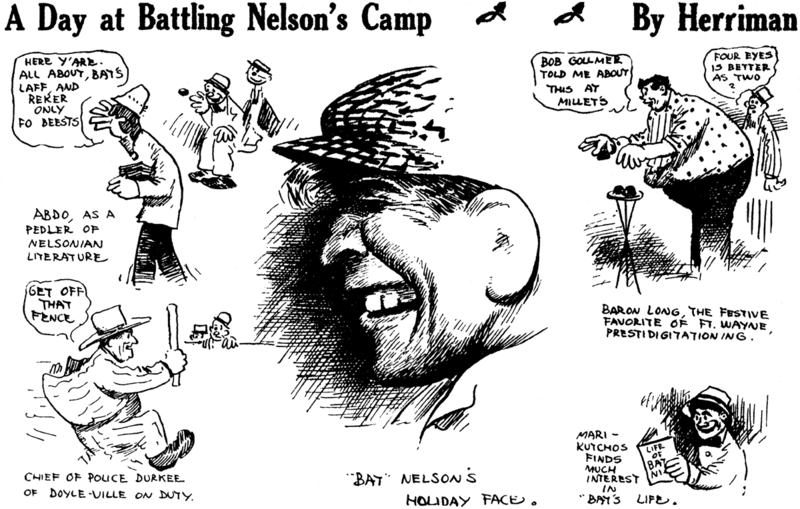 In this issue is presented the final comic strip drawn by Chic Jackson on the day of his death, June 3. The Star has previously announced that the Roger Bean strip would end as soon as the advance material was used. The Roger Bean family was Chic Jackson himself -- some one else could only imitate. Mrs. Jackson desires to join The Star in expressing appreciation to all those who have requested a continuation or a repetition of the strip but it is also her belief that it would have been Chic's wish to have the series end with the last one he made. All unexpectedly, Roger Bean and his household are moving out of the public eye. Don't think of them as a family wiped out by disaster; the only way to destroy them is to forget them. They have moved into the Land of Memory -- there they live content, happy in the love of the friends they made. They are within call; not by telephone or post; not to make return engagements, but by private wires from your own consciousness! Call them to mind, and Roger will come with a smile on his dear funny face, his arm around Cuddles, whom he will continue to tease; he will grin triumphantly, getting the best of Blinky Burleson. He will frown on Woody in mock displeasure over modern expenses. Woody will be going on to school, probably, for Chic wanted to make a doctor out of him. I imagine Golduh and Buck will marry, now that the Beans live more quietly. She can still look after the housework with Buck on the road so much. And Jose will do the "lormry" work indefinitely. In the Land of Memory, Yank will live on unbelievably. I once asked Chic why Yank did not run after the children as he used to do, and he answered me so seriously, "Why, Yank's an old dog now -- he'd rather sit on the porch and wait for them." Yes, the Probes moved out by them; Henry and Alviny would not like to be forgotten, and even when most annoying, I am sure the Beans found them dependable and loyal. Won't the Uncles love to visit them there in that beautiful country? And when you call Cynthia to mind, try to imagine her growing up into a lovely and lovable girl under gentle Mrs. Bean's training. Let me tell you Chic's secret about Cynthia; Only a few know that she is really an heiress! Her real mother's uncle, having made a fortune in Alaska, was disappointed in love and became a hermit; though out of touch with things in general, he learned that little Cynthia, child of his favorite niece, was early orphaned and was in a home for children. You remember how Harry-the-Rat's gang was responsible for her being placed near the Beans' home, where they could keep in touch. They knew she would one day inherit this gold-miner's money. (You knew she had been kidnapped from some place.) Chic was too tender-hearted to have her stolen from living parents, even in a pen-and-ink world. Think of them then as people still. As real as Chic's pen made them for you. Living just in another settlement; inaccessible except by the Rapid Transit route of Memory's Line.